The Holy Bible, as we know it today, comprises the Old and New Testament; both testaments are a collection of books revealed over time. The Old Testament was revealed over a 1,000 year period, 1450 B.C. to 425 B.C. ; The New Testament, was recounted over a much shorter time than the OT, a 60 year period, from A.D. 33 to 100. The New Testament is separated from the Old Testament by approximately a 450-year period which has come to be called the Inter-testimonial period. What many of us may not know is that during Jesus’ time, the term “Old Testament” was not yet named. The Torah and the Prophets canon was already closed 450 years earlier. This is a strong reminder that Jesus and the Apostles only knew God’s Word as the Torah and writings of the Prophets. The question many people have then is how did the New Testament find itself added alongside the Torah, and when did the Torah get renamed as the Old Testament? In addition, how did the books in the New Testament get included in a canon? The First Council of Nicaea was the first ecumenical council of bishops held in 325 AD at Nicaea in Asia Minor (modern Turkey). The council of Christian bishops convened in Nicaea in Bithynia (present-day Turkey) by the Roman Emperor Constantine I in AD 325. This first ecumenical council was the first effort to attain consensus in the church through an assembly representing all of Christendom. Its main goal: 1) to get settlement of the Christological issue of the nature of ‘the Son’ and his relationship to God ‘the Father’, the construction of the first part of the Creed of Nicaea, 2) settling the calculation of the date of Easter, 3) and promulgation of early canon law. The purpose included resolving disputes in the church – primarily those concerned with Arianism* – regarding the relationship between the Father and the Son. Constantine (ca. 288-377), the sole emperor of the Roman Empire, feared that the church would split over this theological issue and thus called a universal council meeting. In May 325, Constantine opened the council where roughly 250-300 bishops attended, the majority from the East. The council produced the first ecumenical creed known as the Nicene Creed, which essentially became a mission statement of Christian orthodoxy and set a precedent for future councils. The church was required to give a more concrete definition of Jesus’ relationship to the Father, further specifying his unique status as “Son of God”, “Son of Man, “Word” or “Logos.” Many solutions had been proposed, yet the efforts to define and agree on Jesus’ nature had been unsatisfactory. The council settled, to some degree, the debate within the Early Christian communities regarding the divinity of Christ. This idea of the divinity of Christ, along with the idea of Christ as a messenger from God (The Father), had long existed in various parts of the Roman empire. The divinity of Christ had also been widely endorsed by the Christian community in the pagan city of Rome. The council reached agreement, though not unanimously, and defined what it believed to be the teachings of the Apostles regarding who Christ is: that Christ is the one true God in deity with the Father. It’s been of large upset for many to learn in modern times, once they do, that it was a man-made decision how to define Jesus. A meeting-of-the-minds, so to speak, during the canonization periods. We aren’t taught about it from the outset, and so when we do finally learn about the Council’s function, we have to revolutionize our thinking. Perhaps a close connection might form for us as to how the Congress works, yay’s on one side and nay’s on the other until finally “a bill is passed”. And so, that is the similar process of the Council of Nicaea. Despite a long history of disagreement, the Trinitarian bishops prevailed. Emperor Constantine may have been a Christian at the time (although this is a matter of dispute: Constantine was baptized shortly before he died). Despite this, he had made Christianity the official state religion of the Roman Empire. Once the Council agreed on what books were canonized as the New Testament, the term Holy Bible also emerged as the combination of the Old Testament and New Testament. Before the establishment of the New Testament Canon, the Torah (Old Testament) was the scripture of the early church. It seems as though that no matter how many verses refer to the intent of Deut. 4:2, studiers of the bible still seem to overlook that it is referring to the Torah (Old Testament), not of the New Testament. The New Testament was not written when Our Heavenly Father commanded that no one should add to His word. Deuteronomy 4:2 “You shall not add to the word which I command you, nor take anything from it”. The reason God is so adamant on this is because “The entirety of Your word is truth” (Psalms 119: 160). “Do not add to His words, lest He reprove you, and you proved a liar.” Proverbs 30:6. False teachers do not want to submit to its original intent, so they do not seek what Scripture actually (exegesis) means, instead, they conform it to what they want it to mean (isogesis). This is why Paul admonishes us in 1 Corinthians 4:6: “not to think beyond what is written”. What was written then? The Torah. So, in other words, Paul is saying to not think beyond what is written in the Torah. When you add words to Torah it is as if you are really taking away from Scripture. With Jesus as an example of obedience to the instructions of HaShem, he dedicated his life to enforce and teach it. This is why Jesus again and again quoted the Torah. Addtionally, for example, in Matthew 10:10 and Luke 10:7. Who or what is Paul quoting? He is quoting Moses. Why? Because Jesus quoted Moses. Therefore, we can easily reason and know that the first century church considered the writings of Moses (The Torah) to be God’s Word. The early church viewed the Old Testament to be “the Bible”. Mind you, during the early church the Torah and Prophets were not yet named The Old Testament, so God’s Word and Scripture was synonymous with Torah and the Prophets, as shown Luke 24:22. All too often we are taught erroneously that when ‘God’s Word’ is mentioned in the New Testament, they are referring to the NT. No! It wasn’t written yet. Jesus himself only referred to the Torah and the Prophets. 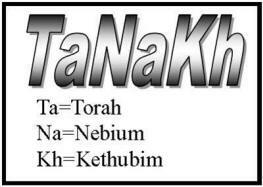 Prior to the canon which re-named The Torah and Prophets ‘The Old Testament’, God’s Word was referenced as the Tanakh, which is an acronym for the 3-part division of the Hebrew scripture, the Torah (The Law), the Nebuim (The Prophets) and the Kethubim (The Writings). Though the term Tanakh is more recent, the designations of the divisions of Hebrew scripture existed before the New Testament era. Luke 24:22 – KJV, And he said unto them, These are the words which I spake unto you, while I was yet with you, that all things must be fulfilled, which were written in the law of Moses, and in the Prophets and in the Psalms concerning me. Then he opened their understanding that they might understand the scriptures. oracle such as orator, oration and the latin verb orare, to pray or utter or speak. The Hebrew word for oracle is dabar “word” in 2 Samuel 16:23 with also the meaning debir “back” in the book of 1 Kings 6:5. Why is this important for us? It is important because Jesus, who lived during the first century, would have known the oral tradition and would have been taught the Torah in this manner. It is also important for us to understand, therefore, the references to “oracles” in scripture. You will see below that the Oral Tradition was entrusted to the Jewish people and that Jesus taught from it. He would have had it committed to memory as the Oral Tradition was passed down by word of mouth while the Temple stood. It is essential to be familiar with The Oral Law as Jesus would have known during the first century. Remember, the NT was not yet written and the only “word” that Jesus refers to was regarding the OT. Therefore, to truly understand Jesus’ words one must be open-minded to know the Oral Law (oracles) which expands on the Torah- written word. The Torah [the written word] is the roots and the Oral Tradition (oral word) is the branches. 1 Kings 6:5, 6;16, 6:19-23, 6:31, 7:49, 8:6, 8:8. 2Chron 3:16, 4:20, 5:7, 5:9. Moral of the blog post?! Don’t be afraid of the Oral Law – oracles (The Talmud) and what it has to teach us. If Yeshua taught from it, it is still good for us. The Torah teaches us everything, even when we don’t know it. For instance, in Genesis 1:7 “And God made the firmament and divided the waters which were under the firmament from the waters which were above the firmament; and it was so.” The firmament is the layer of air that envelops the Earth. In other words, is this verse telling us that there is water in space? Yes. Read on. The Midrash (Oral Law) additionally comments on this Genesis verse. It says, “The upper waters are more abundant than the lower waters.” But in what form is this water they are referring to? The Midrash refers to it in this manner: “Had the Torah said: ‘Let there be a division between the waters on the firmament,’ we would have understood that the waters are located on top of the firmament. But the Torah actually says, ‘the waters which are above the firmament.’ In addition, the Midrash states that the water is frozen. The inspiration and source of this blog post comes from The Coming Revolution,Science Discovers the Truths of the Bible, by Zamir Cohen. I highly recommend his book. .” …The Cambridge Atlas of Astronomy (an encyclopedia of space research) noted- “In the morning of June 30, 1908, a fantastic explosion occurred in a central Siberia valley of river Podkamennaya Tunguska… Witnesses described an enormous meteroric bolide or fireball which was visible in the sky for a few seconds. Seismic shocks were registered. The accepted opinion was that the event was due to the collision of a comet with Earth. Later is was calculated that it was a block of ice 40 meters in diameter, weighing 30,000 tons... Later Professor Fred Whipple from Harvard University, Director of Smithsonian Astrophysical Observatory successfully proved that comets are made up of ice mixed with particles of dust and rock. A small comet contains approx. one billion tons of ice... Today, we know that all the water on Earth is just a single drop in the ocean, when compared with the incredibily large quantities of water that can be found in space” – the firmament, just as the Torah said has water above and below the atmosphere. How cool is our God?! Ecclesiastes 1:9. What has been will be again, what has been done will be done again; there is nothing new under the sun. I didn’t know until I started this study that a Mashal (hebrew) is a short parable with a moral lesson or religious allegory. Again we are reminded of how important it is to understand the history of biblical translation – Hebrew/Aramaic to Greek, Latin and then English and all that we lose along the way. A Mashal is used also to designate other forms in rhetoric, such as the fable. A large number of parables/mashals are found in post-Biblical literature, in the Talmud and Midrash. In fact, The Midrash is largely composed of parables – wikipedia: The Hebrew term Midrash- plural midrashim, means to investigate; or study, also Interpretation; Exposition; is a homiletic method of biblical exegesis. The term also refers to the whole compilation of homiletic teachings on the Bible; a collection of stories that illustrate the deeper meaning of a biblical teaching. The Talmudic writers believed in the importance of the parable, and regarded it as a valuable means of determining the true sense of the Law and of attaining a correct understanding. In the Talmud and Midrash almost every religious idea, moral maxim, or ethical requirement is accompanied by a parable which illustrates it. For instance, parables dealing with kings, for instance, were frequently chosen to illustrate God’s relationship to the world in general and to Israel in particular, as in Numbers 2: 24 the Lord is also poetically likened to a King (Psa. 10:16; Zeph. 3:16-17; Zech. 14:16-17; Malachi 1:14). Israel is the first-born of the Lord (Exo. 4:22; Deut. 14:1). The parables of Jesus, a Hebrew Israelite, were taught in Hebrew or Aramaic depending on his audience. The first 5 books of the NT, however, were written in Greek yet we should never neglect the critical nature of Jesus’ Jewish heritage and how he was influenced by first-century Judaism. For instance, Jesus was learned in Torah and the Oral Tradition (Talmud, Mishnah, Midrash). Given that a parable is a type of mashal or midrash, we now learn why Jesus came to use parables in his teachings based on his heritage. Many Christians are led to believe that Jesus invented parables rather than understand that Jesus taught in the manner that he had been raised – using a mashal to illustrate a teaching. The Greek term for parable is parabole – used typically to translate the more general Hebrew term mashal (plural: meshalim)- a placing beside; a comparison; equivalent to the Hebrew word, mashal, a similitude. In the Old Testament this is used to denote (1) a proverb as in 1 Samuel 10:12; 24:13; 2 Chronicles 7:20., (2) a prophetic utterance as in;Numbers 23:7; Ezek. 20:49, (3) an enigmatic saying as in Psalm 78:2; Proverbs 1:6. Likewise, In the New Testament, (1) a proverb (b), (2) a typical emblem (Hebrews 9:9; 11:19), (3) a similitude or allegory (Matthew 15:15; 24:32; Mark 3:23; Luke 5:36; 14:7). Why does the Pope wear a yarmulke (skull cap)? Pope wears on his head in public and in the liturgy the same as rabbi’s and orthodox Jewish men wear, though not necessarily white. To be certain, the Pope does not refer to it as a yarmulke, but as a zucchetto, which is Italian for a guord. The zucchetto is a round cap of eight triangular panels that have been sewn together. The cap somewhat resembles half of a small pumpkin, hence the name “little gourd” or zucchetto. color-coded to denote rank in the Catholic Church, i.e., the Pope wears a white zucchetto, cardinals wear red zucchettos, bishops wear purple zucchettos, and priests wear black zucchettos, though priests nowadays rarely wear them. There is no doubt, given the Jewish Roots of Christianity, we know from the Torah that the Israelite Priest’s wore head coverings (turbans) in the Holy Temple. Covering the head in the presence of God was a sign of humility. This same act of humility carried over and was also observed in ancient Rome. While Jews may wear any kind of hat, the most common hat is the skullcap known as the kippah meaning “dome” in Hebrew. It is commonly designated by the Yiddish word for the skullcap—yarmulke. The word “yarmulke” derives from the Polish word for cap—jarmulke. Call it a religious skullcap a zucchetto, pileolus, soli Deo, kippah, or yarmulke- it all stems from Judaism. It designates that a man is a servant of the Most High. It’s another discussion on how it came to be that “priest” came to be exclusive with the Catholic Church later on, though it’s origins is from Judaism. God will never instruct us or lead us in a way that is contrary to His scripture. Therefore, if we read something in the Old Testament and then something in the New Testament is contrary to it, that should raise an eyebrow for us. For instance, as written by the author Bart D. Ehrman “…textual criticism – a technical term for the science of restoring the “original” words of a text from manuscripts that have altered them [from the original Hebrew or Greek]. …What good is it to say that the originals of the New Testament were inspired? We don’t have the originals! We have only error-ridden copies, and the vast majority of these are centuries removed from the originals and different from them, evidently, in thousands of ways. …These doubts both plagued me and drove me to dig deeper and deeper…” It does plague me as well, does it plague you? Is the Law really dead? Scripture instructs us that the commandments and law are forever, yet many Pastors and Priests teach that God’s Law is not for us. Some say that the Law is dead with Christ as suggested by Paul. Did you know that Paul never met Jesus? Although there is much scripture that teaches that the Law is forever, still it is taught from the podium that The Law is dead. Why? Why did Paul teach the Law is dead when Jesus did not teach that, and when God said His Laws were forever? Scripture states numerous times that the Law/Commandments are forever; eternal, and perpetual.Why did Paul teach the law is dead when Jesus did not teach that and when God said his Laws were forever? Scripture states numerous times that the Law/Commandments are forever; eternal, and perpetual. You decide what’s true for you based on scripture vs. things your Pastor didn’t mention. ay), e’er, eternally, everlastingly, evermore, ever, forevermore, indelibly, permanently, perpetually. servile work therein: it shall be a statute forever in all your dwellings throughout your generations. sabbaths, and on the new moons, and on the solemn feasts of the LORD our God. This is an ordinance forever. from the beginning: and every one of thy righteous judgments endures forever. that it might be well with them, and with their children forever!